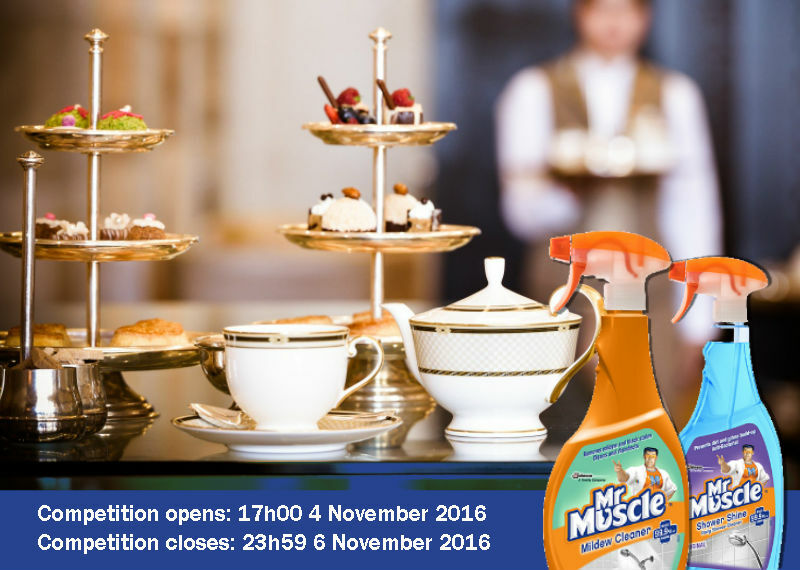 Stand a chance to win a Spa Voucher and a Mr Muscle hamper! Win a High Tea Experience or a Dinner for the Winner and a partner and a Mr. Muscle Gift Basket! Stand a chance to win a High Tea Experience or a Dinner for the Winner and a partner and a Mr. Muscle Gift Basket! 2.1. Entries for the Competition will open at 17h00 on Friday, 4 November 2016 and will close at 23h59 on Sunday, 6 November 2016 (Competition Period). 6.1. The Winner will receive a High Tea Experience or a Dinner for the Winner and a partner to the approximate total value of R 480.00 (four hundred and eighty rand) and a Mr. Muscle Gift Basket, which includes Mr. Muscle cleaning products to the approximate total value of R 250.00 (two hundred and fifty rand) (Prize). The total approximate value of the Prize is therefore R 730.00 (seven hundred and thirty rand). 6.3. We will contact the Winner per telephone to obtain address details and to make arrangements for delivery of the Prize. 6.4. The High Tea part of the Prize will be provided in a town or city within the Republic of South Africa, which is located closest to where the Winner resides and which has a venue available to accommodate the Prize. 6.5. The Gift Basket part of the Prize will be delivered to the Winner per courier at an address within South Africa, or as otherwise discussed, within 30 (thirty) days from the confirmation of the Winner. 6.6. The Prize, or any part thereof, may not be exchanged for cash any other item. Prizes are not transferable. We reserve the right to substitute the Prize, or part thereof, with any other prize of a similar commercial value.